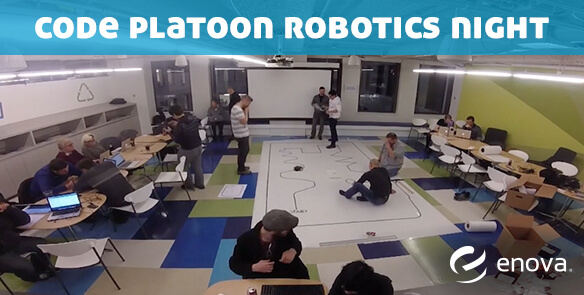 Enova Hosts Robotic Programming Event with Code Platoon - Enova International, Inc. Earlier this year, Enova became a sponsor for Code Platoon, a non-profit aiming to help veterans transition into the workforce. Code Platoon provides technical training for the full Ruby on Rails stack; that knowledge was put to the test at our exciting and challenging Robotics night at the Enova office. Luai Mahmud and Blake Thomas, software managers at Enova, got together to plan four Enova-based events that would take place during the 16-week coding boot camp. When brainstorming potential activities, Luai and Blake decided to do two code-based evenings as well as two hardware-based evenings. Specifically, something innovative, memorable and above all, challenging. They wanted to provide these future-coders with exposure to additional technology that would be fun for them while learning Rails. Additionally, they wanted to put the students’ teamwork and problem-solving skills to the test by pairing them with Enova developers. With these two goals in mind, Robotics night was born! The first night was spent assembling the robots and the second night was for programming. The Code Platoon students were challenged to complete one or both of the tracks laid out by programming the robot to follow the line. They had two courses available: a simple square and a very advanced loop. All teams were able to successfully complete the first course and only one completed the advanced loop. It was a night of trial and error as well as success. Enova is so glad to have had the opportunity to work with these future coders for a fun night in robotics. Below is a time-lapse video of our evening so you can see all the fun for yourself. ENOVA Code Platoon Robotics Hacking Night from Enova on Vimeo. If you’d like to donate, become a sponsor or learn more about the Code Platoon program, please visit our website.